My popcorn making adventures continue with the help of super cheap kernels in the bulk section at the grocery store. I was scanning the internet for some unique ideas when I came across cinnamon cashew corn. What stuck out was the cashews… when I think cashews, I think Indian food! With a little help from my spice cabinet I came up with this recipe. Mostly savory, a hint of sweet, and lots of fun textures. I love the idea of trail mix, but the generic mixes are really high in calories. Have you looked at one of those labels lately? 250 calories for a 1/4 cup of trail mix. Who eats only a quarter cup? (Ok maybe my mom). But if I want a snack, I don’t want to feel limited to some measly little handful. 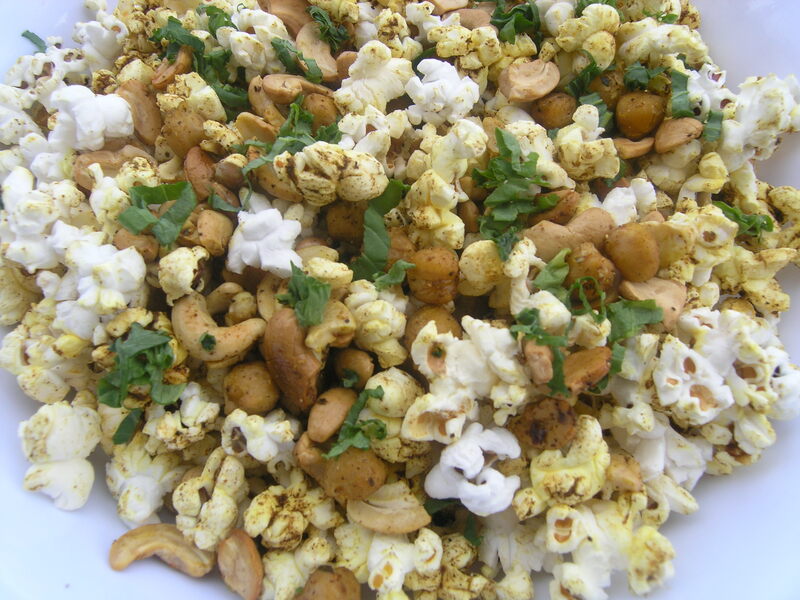 This popcorn mix has bulk without the calories or fat in the popcorn, lean protein and fiber from the baked chickpeas, and that necessary crunch and fat from the cashews. A well balanced snack mix. Dry the chickpeas with paper towel after you rinse them. Drizzle 1 tbs of vegetable oil on them and bake in the oven for 15 minutes. Remove from the oven and leave on the pan. While the chickpeas are cooking, cook the kernels according to package directions. I have an air popper, which is the best $20 or so a person could ever spend. No mess, super easy. In a small mixing bowl, whisk together the remaining vegetable oil with the spices. Lay the popcorn and cashews on the cookie sheet with the chickpeas in a single layer. Pour the spice mix over the popcorn, mixing together well with your hands to get everything incorporated if necessary. Smooth into one layer again. Bake the popcorn for 15 minutes. Pour into a big bowl and top with cilantro. Can’t wait to try this one…as I do love my popcorn. Staple in my diet!